Generally I fabricate complete swingarms for clients out of 4130 chromoly in either round or aerostrut tubing, however, a friend of mine needed his stock swingarm lengthened and didn't have the money for a complete new swingarm so I just lengthened his stock one. Here are few before and after pics. I don't have any of the swingarm on the quad as of yet. I just finished painting the swingarm this morning and will install it tomorrow. Thanks for looking, Mike. This the the swingarm prior to cutting. Here are a few pictures of my welds. This is the sub-structure fabricated and ready to weld between the two halves. Last edited by zmotorsports; 09-26-2010, 02:55 PM. These next two pictures of are some small gussets that I welded in place. This last picture is of the complete swingarm ready for paint and installation. I use to have a Banshee and the problem I see is that your weld will not match up to the factories, they are too pretty. Here is mine, at 50, I run mine real fast, "for a short distance", as the younger one chase me, then shut it down and say, hey, already won, why go further. Thanks for the compliment. I never seem to be quite satisfied with my welds but they seem to get better with practice. I like your quad. That is a nice looking Fourtrax. Mike. Here are two final pictures. The first is of the swingarm installed. The last is the completed quad ready for the client to pick-up complete with new tires/wheels and a few engine mods. Mike. The modification to the existing swingarm on this quad ran $150.00 less paint. That did not include the labor to remove or reinstall the swingarm on the quad. If you are not in a hurry this particular swingarm is going to be for sale in a month or two. I purchased the Banshee from him recently and I am going to tear it down and build me an aero-strut style swingarm along with a few other chassis mods and paint & chrome. If interested let me know and I can shoot you some information once I get the quad torn down. Interested!! How much if it is still for sale? The modification to the existing swingarm on this quad ran $150.00 less paint. That did not include the labor to remove or reinstall the swingarm on the quad.If you are not in a hurry this particular swingarm is going to be for sale in a month or two. 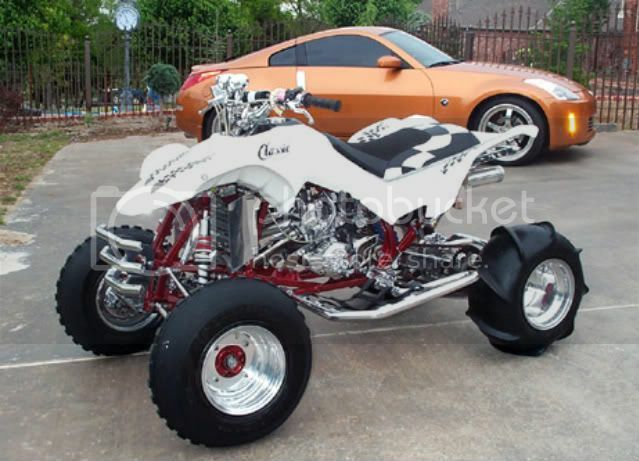 I purchased the Banshee from him recently and I am going to tear it down and build me an aero-strut style swingarm along with a few other chassis mods and paint & chrome.If interested let me know and I can shoot you some information once I get the quad torn down.Mike.